Letting nature “take its course” is a fine hypothetical attitude, appropriate to us scientist, noble, nuanced, etc. but this moves me to tears. The resident coyote was –is– very precious to me. I feel connected to her. and will continue to root for her to prevail. Hi Toni — It’s absolutely heartbreaking. I don’t know anyone who is not rooting for her and her comeback. It may happen yet: coyotes are patient, resourceful and resilient. She has not given up hope, so we should not either. Thanks for all your information, knowledge and care. This has been very sad for me, I have seen her for so long there, being alone and still happy, suddenly, she finds a nice young male coyote that started to be with her, but to defend her territory, she had to fight with another female coyote who is wired with a radio collar on her, so the fight was completely uneven. I understand nature and respect how it works, there’s not much that we can do, but in this case, makes me really mad and worry, to see that there is a coyote that is normal and another one that has a metalic radio at the place where they are more sensitive, and that will protect her in any fight that she gets into with the coyote that was living there and loved by us for 3 years. I really hope that something happens that drives this new female coyote away. Thank you for the update on our beloved coyote. It’s great to see that she seems to have recovered from the worst of her wounds, so I’m hopeful for her future. I’m inspired by her resilience and her determination. What a wonderful animal! I don’t wish the newcomer female I’ll, since she is just trying to survive and find a home in this tough city. Please do keep us posted on developments, since we wait eagerly for news! I agree that no ill-will should be heaved on our new female: she, too, is simply trying to stay alive, and it is through no fault of her own that she was nabbed and radio-collared. Hopefully we can work on preventing the kind of human interference which gave her an advantage: that human intervention with unexpected consequences is what needs to be examined. I am so pleased that she at least physically recovered from her ordeal. For a while, I was quite worried. Their lives are indeed full of stress and tension—as well as happiness and lightheartedness. Your window into their world is something that has further hooked me on coyotes—such wonderful beings to fall in love with. Yes, their lives encompass the gamut of all emotions and states. I’m so glad to have helped you fall in love with them. They are definitely worthy of our love and admiration. Thanks, Melinda! 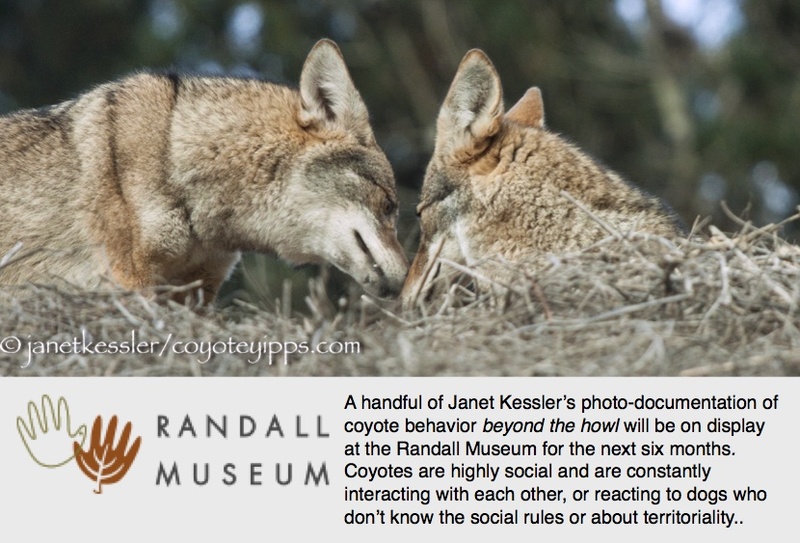 Hi Janet.. love to read all about the ongoing lives of your Coyotes..hopefully, as you say, no more fights… they are truly wonderful animals. I love them so much… really enjoy reading all your posts …. Thank you for keeping me deeply connected to Coyote. My heart…. Thank you Janet for all that you do. It is such a great service to the community. Can you please help me understand why being “wired” gives a coyote an advantage in a fight? I can’t seem to work out why that would be the case. Thank you. Hi Deb — Please read my posting on Detrimental Effects of Radio-Collars posted on March 8th. Thank you. I saw it right after I posted. Very informative. Also, what about the male? Have there been any sightings of him lately? He’s gone: no sightings at all. Has anyone seen her mate?.Sad if he left for good. Hi Jeannie — If he had been her mate, he would still be by her side. I think she was hoping for that, but he wasn’t on the same page. He traveled often and far during the time he knew her and had not really settled down. The two of them as a “pair” could have warded off the newcomer. Instead, the male, who was after all a youngster, fled. I have not heard of any sightings of him anywhere since a couple of days after the territorial battle. Thank you Janet.Sad that she does not have him around. Seemed she really enjoyed it.She had been a loner for a long time.Quite attached to that girl. Yes, the breaking up of the “pair” was the biggest part of the tragedy. Let’s see what happens: coyotes are extremely resilient.